I've had a little niggle in my lower back lately -- nothing crazy or worrisome. Just a bit tender, maybe from crazy inversions, maybe from the wild amount of book lifting from last week, but whatever. It seems to have set itself right after a week of taking things easily and more considered. The pain, as angering and frustrating and stupid as it was, also made me more aware as I worked into poses. I have always known my core to be my weak(er) point and something I need to activate more. Well, nothing like a little pain in the low back to get you back into feeling. A roadblock, detour ahead. Yeah, you want to go to your back? Think again, that road is closed! Take the core path. I also became aware of this incredible muscle in the body called the PSOAS, which links the bottom of the spinal column (starting at the 12th thoracic vertebrae) through the hips to the upper inner thigh bone. It is one of the largest and thickest muscles in the body (also known as the tenderloin in animals). Check it out below, cool eh? Apparently it is a tough muscle to massage, needing access through the hip, accessed under the intestines, quite the personal area, smack IN the hips, a space full of emotion. But anyways, seeing the layout of this muscle, it got me thinking about internal rotation of the legs, and the sheer length of the legs. 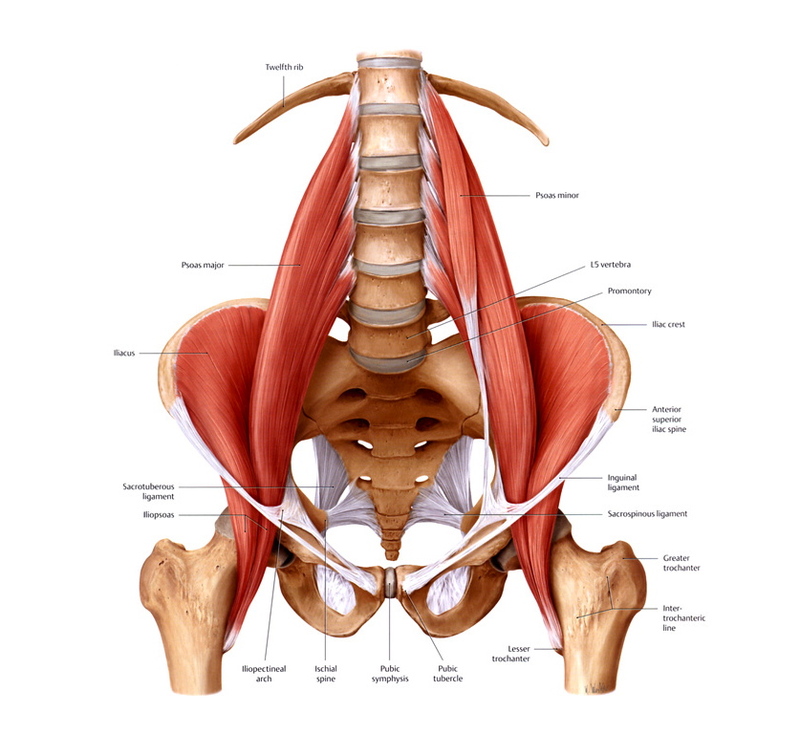 Internally rotating my legs, thinking of the PSOAS, means that I am accessing that muscle but also extending into opening my back. So my legs don't end with my leg bones but actually extend into my lower back. Now that is something to think about in yoga classes. Learning anatomy (and getting injured, HA!) is just an incredible way to deepen a practice. Don't forget thatthere is a difference between injury and muscle strain.